The TMNT are teleported by the Utrom’s Transmat device to the alien city of Peblak. As soon as they arrive, the Turtles are confronted by armed soldiers (who are here to capture the Fugitoid). 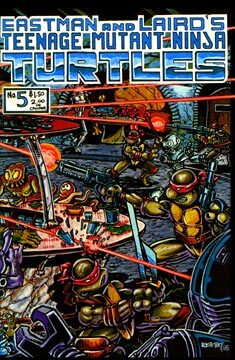 Since the Turtles don’t notice the robot standing behind them, they decide to defend themselves and attack the gunmen. As the battle erupts, the Fugitoid punches a whole through a wall and invites the TMNT join him as they flee from the ever-growing number of soldiers. The group make it to a rooftop with the military in hot pursuit – their only chance for escape is to jump from the top of the structure into a garbage truck far below. The Fugitoid is afraid of heights, but the TMNT take him with them as they make the leap. 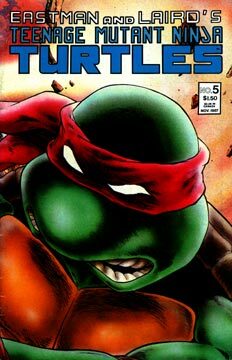 After a short ride where the TMNT are shocked by the sights of the alien planet, the team make it to cover and the Fugitoid explains to them where they are and who he is. The Turtles agree to an alliance with the robot as they’re “all in the same boat,” being pursued by the authorities. The group decide to head for a spaceport near the sea. Leonardo laments that they’ve finally found a world where they can walk out in the open without fear of people being frightened by their appearance, but they can’t do so because the military is hunting them. Meanwhile, both General Blanque and the Triceratons plot to capture the Fugitoid. Our heroes head into a bar to try to find some information and assistance, but are spotted by the soldiers. A bar brawl breaks out and then the Triceratons show up in force and capture the Fugitoid. The Turtles steal an air car and go after the Triceratons who are taking the robot back to their base. Sadly the Green Team is spotted by a squad of Triceratons and an air battle ensues. The Turtles’ car is hit and they’re forced to bail out from a great height. Fortunately, a thick canopy of trees breaks their fall and no one is hurt seriously. When the lads fully recover, they find that General Blanque’s men are in an all out war with the Triceraton troops. Through the chaos, Leo spots a Triceraton carrying the Fugitoid into a structure. The TMNT scramble to help their newfound friend. Unfortunately the structure turns out to be a ship, and it blasts off into outer space. The Triceratons try to sweet talk the Fugitoid into creating the Transmat for them as the ship approaches the gigantic Triceraton base. Meanwhile, the TMNT are trapped in a cargo bay of the craft and discover that it doesn’t contain gravity… or oxygen!